Pope Francis on Sunday told the faithful not to remain trapped in the rubble of life, but to rise from the rubble and rebuild their lives with the help of God. 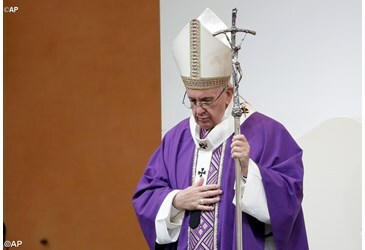 The Pope’s words came during the homily as he celebrated Mass for about 70 thousand people gathered in the central square of Italy’s northern town of Carpi. His one-day visit to the Emilia Romagna region comes after a pair of deadly earthquakes five years ago and where extensive restoration efforts have been cited as exemplary. 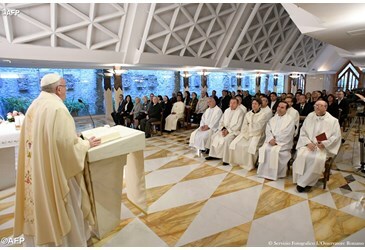 Reaching out to those who lost loved ones and livelihoods during the 2012 quake, Pope Francis said God does not magically make bad things vanish, but He is close to those who suffer and faith has the power to transform that suffering. Reflecting on the Gospel reading that tells of the resurrection of Lazarus, the Pope recalled that Jesus himself wept for the death of Lazarus, but “within the mystery of suffering in which rationality is shattered and crushed like flies against a glass pane” he said, “Jesus does not allow himself to be imprisoned by pessimism”. Before that sepulcher, he said, on the one hand there is sorrow, delusion, precariousness; on the other there is hope “that conquers death and evil”. “Jesus, he continued, did not offer a remedy to lengthen life, but proclaimed: ‘I am the resurrection and the life; whoever believes in me, even if he dies, will live’”. Pope Francis said that we are called to decide on what side to stand, and either close ourselves in sadness or be open to hope. “There are those who remain buried in the rubble of life, and there are those, like you, who with the help of God rise from the rubble to rebuild” he said. 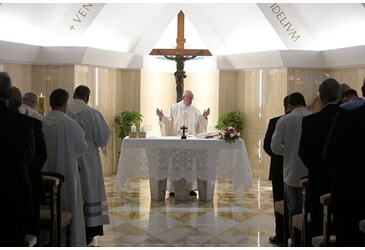 Francis invited the faithful to avoid the temptation to be imprisoned in hopelessness and self-commiseration, to not yield to the useless and inconclusive logic of fear and resignation. “Jesus’ words to Lazarus are also meant for us: leave sadness and hopelessness behind; with Jesus hope is reborn and pain is transformed into peace. He is always there to help us rise” he said. Before celebrating Mass the Pope visited the quake-damaged Duomo cathedral of Carpi, where he laid a bouquet of white flowers at the foot of a statue of the Madonna inside. After years of restoration, the cathedral reopened just last weekend. During his daylong visit, Pope Francis is also scheduled to meet with families who lost loved ones in the quake, lunch with clergy and meet privately with priests, nuns and seminarians for an open discussion. The Emilia Romagna model of rebuilding after the magnitude 6.1 and 5.8 quakes that killed 28 people in 2012 has often been cited as exemplary. It included bringing together politicians, entrepreneurs and bishops to decide common priorities. 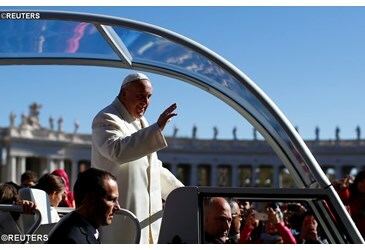 The papal visit is seen as a sign of gratitude for the rebuilding and as a sign of hope that rebuilding is possible for the people of central Italy, who suffered an earthquake in 2016 that killed nearly 300 people, displaced tens of thousands and wreaked extensive damage to homes, businesses, Churches and infrastructure. Prayer is powerful. Prayer conquers evil. Prayer brings peace.